Born in Wichita, Kansas, to Philip and Pauline (Lohkamp) Roets. He loved and admired his parents and 15 brothers and sisters. 1927-1935 Elementary Education: St. Joseph's School. Wichita. Minor Seminary. St. Joseph's Seminary and College, Kirkwood, Missouri. 4 years high school and 2 college. 1941-1942 Novitiate: Religious Order of Redemptorists (CSsR). Major Seminary. Oconomowoc, Wisconsin. Two years philosophy and 4 years theology. Tutored fellow students in Latin and other subjects. Coordinated the "snow removal" crew; raised rabbits. 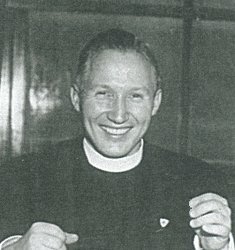 June 6, 1948 Ordained Catholic priest. First assignment as priest was to St. Louis where he helped take parish census and began work with the deaf - a lifelong interest and service. Catholic University in Washington D.C. Earned Licentiate in Theology, STL, plus Semitic languages. He worked on translating the Dead Sea Scrolls. While in D.C. he did much parish work on weekends in DC, NJ, VA, and NY. He also assisted the military chaplain at Fort Myer, VA, with religious services and education classes. Pontifical Biblical Institute, Rome, Italy. Completed the Licentiate in Sacred Scripture, SSL. Exams from May 12 to June 8, 1952, included: 33 hours-written, 11 hours-orals, and 1 hour defense of thesis. Phil's best memories of Rome include seeing great art, learning from outstanding teachers and fellow students from around the world, and seeing historic places. He also added Italian to his list of languages. Retreats for high school students in Minneapolis and adults at Retreat House, Oconomowoc. Many retreats and Days of Recollection in Wisconsin, Iowa, Minnesota, Michigan, Kansas, Oklahoma & the east coast. Series of lectures on Bible for clergy/educators in Wisconsin, Iowa, Michigan, Indiana, & Kentucky. Visiting counselor/chaplain for Vets Hospital in Waukesha, WI, and Fort Myer. VA. Guided Bible Study Clubs in family neighborhoods. Advisor and confessor to religious men & women in Wisconsin - on a weekly basis. Advisor and counselor to many who sought his help. Teacher/lecturer on Old and New Testament studies on weekends and summer (in addition to regular teaching at the seminary and conducting retreats). Audio tapes of some of these lectures still exist. Alverno College, Milwaukee, WI Seminarians, priests, nuns in WI, IA. June 7, 1969 Married Lois Schelle at Catholic Church in Rio, WI. Taught 6th grade in Pardeeville, WI, and enjoyed it. Began writing Commentaries on the Bible and Wildlife Series for students. Wrote first draft of "Books of the Bible". Presented paper "The Spirit of Yahweh: A study of the meaning of the word 'Spirit' in the Bible" at the annual meeting of the Catholic Biblical Association (CBA). October, 1980 Moved to Iowa for family-related reasons. New Sharon, Iowa. Taught science to 8th graders. Oskaloosa, Iowa, as a year-long substitute. Phil had natural talent and life-long interest in science - all areas. Taught remedial reading and math for grades 3-8; taught accelerated and enriched reading for kindergarteners. Taught graduate courses to teachers - "Reading Strategies I" & "Reading Strategies II". Wrote booklet "200 Considerations to Promote Mental Health" & workshops on it. Continued study and translation of Old/New Testament - original languages. Continued writing commentaries on Old and New Testament. Translated Biblical quotations for each day of the year. Wrote booklet "200 Encouraging Quotes from the Bible and Notes by Phil Roets"
Wrote a twice-weekly newspaper column "Word to the Wise" for the Oskaloosa Herald, Oskaloosa, IA. 1988- fall Phil and Lois move to Des Moines, Iowa. Phil taught at Des Moines campus for Upper Iowa University: Spanish I, Spanish II, Business Ethics, Intro to Philosophy, and Philosophy of Religion. This last course used Phil's book "Books of the Bible" (1992) as textbook. Tutored students in reading, French, Italian, composition. Continued writing commentaries on Bible. Began monographs on Biblical themes. Celebrated 25th wedding anniversary in Iowa & Wisconsin. Retired from formal teaching and tutoring. Continued writing commentaries on Bible and Biblical themes. Some themes were not complete at the time of his death but 1000+ pages were completed. 1982-2002 Accompanied and assisted his wife, Lois, on her workshops on education of gifted. 1969-2002 Enjoyed family, friends, and neighborhood events. Taught sign language and was "on call" in communities to assist the deaf. Gave counsel and spiritual guidance on individual basis - as requested. Audio tapes of lectures on Bible. Translation from French - "The New Testament, Always New" author Charpentier. "200 Considerations to Promote Mental Health"
"A Pocket Companion to Wisdom"
"Greek and Latin Prefixes and Word Parts"
"200 Encouraging Notes from the Bible and Notes by Philip G. Roets"
"Biblical Quotations for Each Day of the Year"
Commentaries on Old and New Testament using translations from original languages of Hebrew (OT) and Greek (NT). Thematic monographs on Biblical topics. Collections of his newspaper columns. Wildlife Articles for Students - nonfiction. Excerpts from Phil's personal journals on teaching, death, love, the Bible, & nature. Phil and Lois were jointly writing this book so maybe Lois can finish it. More monographs on Biblical issues and themes. Fiction based on Phil's wildlife writings. Book: "Men & Women of Bible: Why Were their Stories Included in the Bible?" Philip died of complications of cancer, at 5:45 p.m. at Iowa Methodist Hospital, Des Moines, Iowa. He was one month shy of 81 years of age. Phil's favorite gospel was the Gospel According to John. He was editing/reviewing his commentary on John the day he was taken to the hospital on a 911 call. Phil's comfort in his last days was the Good Shepherd. Phil believed the message of Jesus is the Good Shepherd - nothing showy nor grand but daily service to others. Recreation: reading (Grisham, L'Amour); word puzzles; conversation with family, neighbors, friends at the post office; TV: Jeopardy, Wheel of Fortune, Mystery; Movies (videos viewed at home): Driving Miss Daisy, Cool Runnings, Mighty Ducks, Les Miserables-the 10th anniversary performance in Albert Hall. A ride into the country was always welcome - all seasons, the contentment of being home, and living our way of life. "We'll live our lives as we see fit", was his guideline. Phil had natural and cultivated appreciation of fine arts. Music: Two operas he really enjoyed: "Lucia di Lammermoor" by Donizetti and "The Abduction from the Seraglio" by Mozart. He also liked Gilbert and Sullivan's operettas and folk songs like "You Are My Sunshine". Phil had a beautiful tenor voice and sang with joy at Song Fests and Christmas carols at home. Theater: He appreciated dialogue and ability of performers to bring life to lines that tell a story. He got a smile on his face when he remembered the performance at the outdoor theater in Spring Green, WI, of Moliere's "Le Tartuffe" and dubbed the lead character "the pious fraud". He also happily recollected the performances produced during seminary days. Artistic expression was always appreciated, especially sculpture. Rome was filled with sculpture. "The Pieta" served as a visual guide to understanding Mary's role as described in the gospels. Phil willingly visited art museums and appreciated original art. He and Lois bought art for their home- professionals and amateurs. Phil studied & completed ceramic works; admired works created in glass (fragile yet strong); and photography to record people, events and sights. Phil lived a full life of service. He is missed by many. His good influence lives in many, many people around the world.